World Challenge is a tough series, and it has been tough enough to Brass Monkey Racing, to not be able to make the third round of the series. 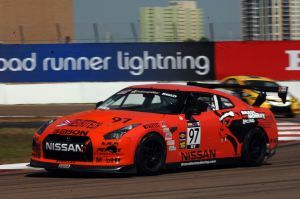 At St. Petersburg, Tony Riveras GT-R hit the wall, and both cars were several seconds off pace. After racing testing, showed some items that should help them pick up some time. Their next race will be at Miller Motorsports Park, April 29th and 30th. ANGLETON, Texas - Brass Monkey Racing has elected to skip the third round of the SCCA Pro Racing Pirelli World Challenge Championship at Long Beach this weekend, with a return slated for its Nissan GT-R program two weeks later at Miller Motorsports Park, April 29-30. With a limited amount of paddock space at Long Beach, the series capped the number of entries to the event. Following a tough season-opening weekend at St. Petersburg, Fla. March 25-27, Brass Monkey Racing was unable to meet the Long Beach deadline to commit its presence at the event. “There were a number of reasons why we weren’t quite able to commit for Long Beach within the days following St. Petersburg,” Team Manager and driver Tony Rivera said. “We had the damage to my car and some handling and braking issues to solve in both cars. By the time we knew we’d be ready with at least one car for this week’s event, it was past the deadline. Brass Monkey had mixed results at St. Pete, with Rivera crashing out on lap three of the first half of the weekend doubleheader and missing the second. Steve Ott had a solid run in Race One, scoring a sixth-place finish and Nissan’s first Manufacturers’ Points in World Challenge GT since 1994. Sunday’s race was a struggle for Ott, as he picked up some plastic debris in his grill, causing the car to overheat throughout the contest. Brass Monkey Racing will return to the Pirelli World Challenge for Round Four from Miller Motorsports Park, in Tooele, Utah, April 29-30.